Polaris Ranger, Razor, UTV ATV snow plow Super Heavy-Duty Skid Shoes, 2873423 These Super Heavy Duty Skid Shoes relieve the bottom of a plow blade from excessive wear by serving as dual points of contact when the blade is put on the ground.Now with 3-1/2" Bolts Compared to the 2-1/2"- 3" used on most Polaris Shoes,this allows for more Height Adjustment.These Shoes are nearly Twice as Thick as Any Polaris Shoes on the Market for Extra Long Wear.Each plow blade uses two skid shoes and these skid shoes are sold in pairs with nuts, lock washers included.Gloss Black Powder Coated for a High-Quality,Durable Finish.These Skids Are Proudly Made In The USA. 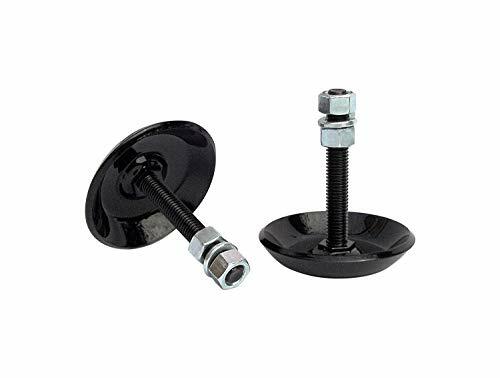 Dimensions: Bolt length: 3-1/2" Of Full Thread Adjustment / Bolt diameter: 1/2" X 13NC / Shoe width: 3.5"
Now with 3-1/2" Bolts for more Height Adjustment. Price is for a Pair with nuts and washers included.